RP-8000, Turntable from Reloop in the RP series. 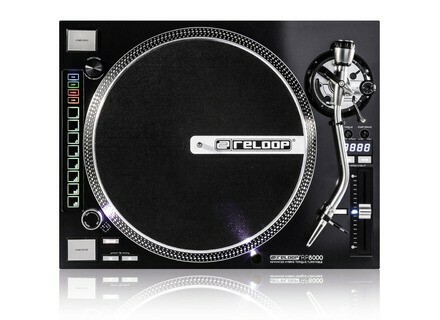 Product replaced by the Reloop RP-8000 MK2. Reloop unveiled this week-end at BPM Show 2013 the new products that will be launched this winter, including the RP-8000 hybrid turntable. 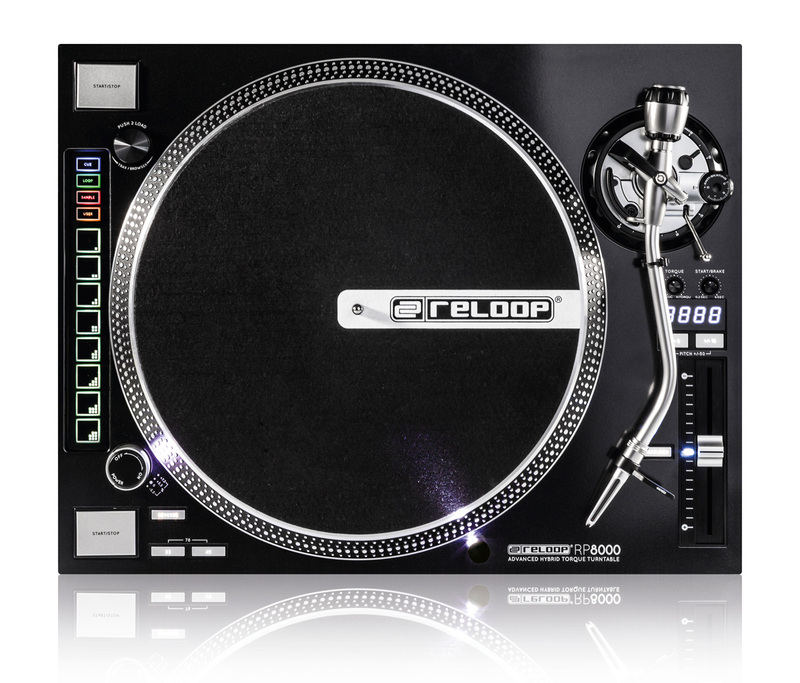 The Reloop RP-8000 is designed for digital DJs who mix with a PC/Mac, for it features a digital control section and MIDI communication to their favorite DJ software. The right side of the device features a Trax rotary encoder for playlist browsing and tracks loading to the decks, 8 multifunction assignable pads for triggering loops and drums, as well as 4 Mode buttons for Cue with up to 8 cue points, Loop, Sample and User, the latter with an additional memory bank to save the user pad assignation. A Dual Performance function allows for using two modes together by simultaneously pressing two Mode buttons ; if you choose to use Cue and Loop, for example, with this function the 4 first pads are assigned to Cue and the 4 others to the Loop mode. The unit also includes an LCD display on which you can, for instance, check the pitch control (±8%, ±16% and ±50%). Last, it will be possible to link up to 4 decks via USB thanks to the Turntable Link USB port and connect only one of them to the computer. The system will automatically configure and assign the connected turntables to the decks. The turntable offers three speeds, and two Torque and Start/Stop buttons allow for adjusting, respectively, the Torque weight between 2.5kg/cm and 4.5kg/cm and the start/brake time from 0.2 yo 6 seconds. A pitch fader is also included, as well as a Reverse switch. The RP-8000 also features dual switchable Phono/Line RCA connectors. Reloop offers mappings for Serato Scratch Live, but did not specify whether Serato Live users will receive specific mappings. Visit www.reloop.com/reloop-rp-8000 for full details about the RP-8000. New Pioneer DDJ-SR 2-channel DJ controller Pioneer has a busy agenda in september, and introduces today its newest DDJ-SR two-channel MIDI controller optimized for Serato DJ. QuNeo wireless transmitter announced Keith McMillen launched on Indiegogo a new crowd-funding campaign for the Rogue accessory for the QuNeo MIDI controller. Pioneer DDJ-SP1 4-deck controller for Serato Pioneer DJ will launch in october the DDJ-SP1 four deck MIDI controller designed to control, mix and scratch with Serato DJ software.